Located right next door to the Neraida Studios is a swimming pool and snack bar. 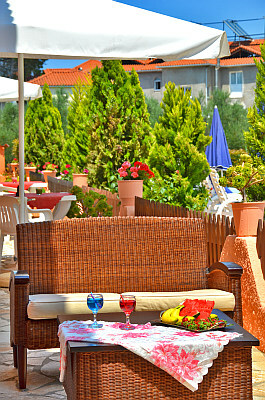 The pool is spacious with free sunloungers and umbrellas and it is open to all our guests. The snack bar is open from the early morning for breakfast and until late at night serving snacks, refreshments, cocktails, ice creams, coffee and more.